Artificial silk is a filament made from the cellulose in wood. From the turn of the 1900s this transformative textile was manufactured in the UK in huge factories employing workers from all round the world. Filaments of silk from the cellulose in wood were twisted together and woven into clothes, war-time parachutes, sanitary wear for hospitals and many other forms. M&S used artificial silk for nightwear. In Britain, artificial silk was first mass produced in Coventry during the 1920s, and a second factory opened in Preston, Lancashire, on the eve of the Second World War in 1939. Viscose and rayon are alternative names for artificial silk. 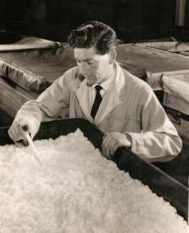 The process of making artificial silk began with a shipment of wood pulp from Canada, and through a complex series of processes the Lancashire factory transformed cellulose in the wood to off-white textile yarn which could be made into the finest denier of women’s stockings or filaments as coarse as horse-hair. Positioned at the end of the railway branch line which ran from Preston docks north to the factory, workers in the pulp storeroom layered thin sheets of wood pulp onto a Collis truck in 650 kilo batches. On the steep floor of the factory different workers slipped single pulp sheets between two heavy metal plates in the press until it was full. After steeping the sheets in 18% caustic soda the wood pulp was squeezed in the press. Now known as alk-cell, it was dropped down a chute into a Pfleiderer whose metal teeth chewed it into little pieces. These pieces were raked from the Pfleiderer into bins and sent to the mercerising room. Alk-cell was produced from the cellulose which was extracted from the wood pulp. A few days later the mercerising bins were taken up to the floor above the churn room and the alk-cell crumbs were dropped through a hole in the floor into huge metal churns where CS2 was added. After xanthation, which changed the material to a yellowy colour, the crumbs were dropped through another hole in the floor into a mixer. Caustic soda changed the alk-cell crumbs into a viscous solution with the thickness and colour of honey. It was not half so sweet, nor edible. The liquid viscose was sent through huge pipes under the main road of the factory, a thoroughfare called Viscose Alley (really), to the spinning buildings on the other side. 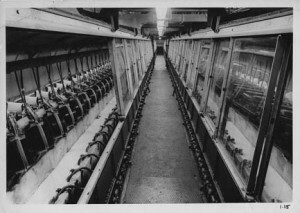 In the Spinning department the viscose was extruded through the holes of industrial-size showerheads into troughs of acid. 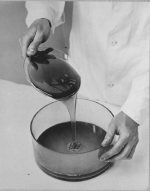 Here the liquid regenerated in seconds from honey-like viscous liquid to long filaments of artificial silk that was durable enough to be woven into knickers or WWII parachutes. The rotten egg smell in the spinning department came from 10% sulphuric acid in the baths which neutralised the caustic soda in the viscose. 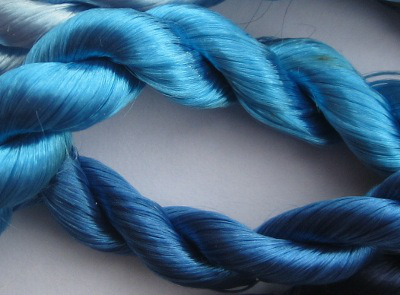 If a factory order was for coloured yarn, the right mix of pigment was added to a receptacle at the top of the spinning machine before the regeneration stage. Once hardened from its liquid form, the yarn was wound onto cones, then bigger cakes which were washed and dried and washed and dried again. One of the lab worker’s jobs was to test the softness of the boiler waters to make sure the viscose fibres didn’t stick together. Another was to make cross-sections of filaments in the darkroom, to test their strength. These jobs were the responsibility of Jean Crossthwaite, who worked in the laboratory. An important task for lab workers was to create a myriad of textile shades and give them names. Here are a few of the blues: Flying Grey, Fathom, Fog, Neptune and Keswick Blue. Over 500 textile shades were created in Lancashire before the factory gates shut and Britain’s textile industry fell into decline. It is enjoying a revival in the early 21st century with the weaving of eco-friendly coffins, Formula 1 tyres and bespoke fashions. At the Lancashire factory, filaments of viscose yarn were pigmented in an amazing array of colours from a Curry Brown to Carousel Red. Some shade names were intended as jokes, like Camy Pink for camisole knickers and Attic Brown for a dusty attic. Other names reflected social structures such as Collar Blue, indicating manual rather than office-based labour. Artificial silk yarn was eventually packed and transported from Preston to factories all over the world. The filaments were woven into M&S dressing gowns, sanitary towels, tights, webbing for car tyres, surgical dressings, gossamer for war-time parachutes, and fashion that is now labelled vintage. Because of its versatility, artificial silk was combined with different textiles such as wool, cotton, or real silk to make upholstery and carpets, and for stuffing shoes. The process of making artificial silk was continuous. The machines never stopped. If they had, the amber-coloured liquid would have solidified in the pipes under Viscose Alley. That is what the viscose will be like now under the tarmac of the current factory site north of Preston in Lancashire, home to several smaller businesses. A three-shift pattern was how the factory operated, with workers there day and night. 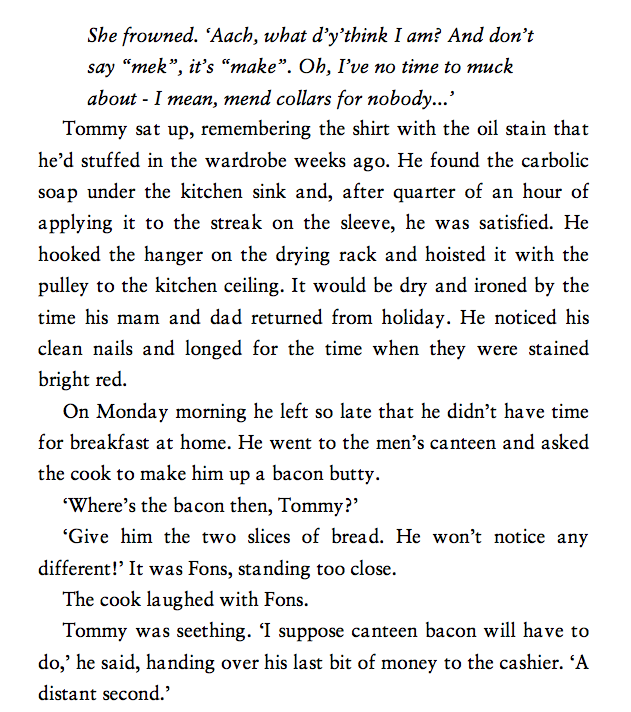 Sometimes leftovers were brought in from a previous day’s tea, or rashers of bacon for the factory kitchen staff to cook up. Click here for more sound recordings made during the Colours, Community and Chemistry exhibition.